There are a number of possibilities for how a vessel-whale-collision can be avoided. The most obvious one is a reduction of vessel speed. Today, there are several areas where mariners are recommended to limit their travelling speed, e.g. in the Strait of Gibraltar, off Georgia (USA) or in the traffic separation scheme off Boston (USA). Elsewhere, shipping lanes may be shifted away from cetacean concentrations, as has been realized in Southern Spain and in the US. Additionally, technical systems to warn mariners have been installed on the US East coast. 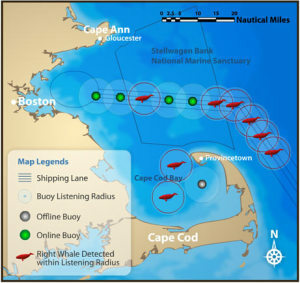 Off Boston (Massachusetts), the presence of whales is recorded via underwater microphones, and their location is reported to vessels frequenting the area. Off Georgia and Florida, ship crews will inform others about their sightings of whales in certain areas. A similar system (REPCET) is being tested in the Mediterranean Sea at the moment. Most of these measures are voluntary; hence a reduction of collisions has been witnessed only rarely. 90% of world trade is handled by shipping today and “time is money” – therefore, measures like speed limitations are not very welcome. Meanwhile, several studies suggested that dedicated observers on board to spot whales in the travel route of a vessel can be helpful, because ship crews will be warned in time and avoiding maneuvers can be initiated – which is especially important in fast moving ships. In general however, national or international legislation is still the exception, but governments are urged to get more involved. Otherwise, an accident with a bad outcome for passengers or crew may take place before action is taken, but that obviously should not be an option. As a minimum, mandatory reporting for vessel-whale collisions, e.g. a duty to report collisions to the data bases mentioned above and/or to the authorities, appears necessary. Concerning educational efforts, ship personnel should be informed about where and when cetacean can be abundant, how collisions can be avoided and what has to be done in case a strike occurs. The Belgian Government – which is especially active within the IWC – has developed an according information leaflet in several languages (see right or follow link). But the “power of the consumer” may play a crucial role too. In some places it might be prudent to inform passengers about alternative travel means than, for example, high speed ferries, instead of waiting years and years for political action. 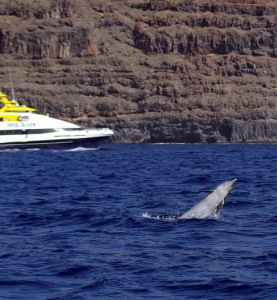 As an example, the new Superferry that operated in the Hawaiian archipelago in 2007 had to stop operation due to public pressure, because the ferry routes went through important breeding habitats of humpback whales while the operator had not conducted a proper environmental impact study. A number of technical measures today are discussed to be used to reduce the number of collisions. These include active acoustic systems like Sonar (Sound Navigation and Ranging) or Ladar (Laser Detection and Ranging), i.e. the projection of sound or laser light to detect the animals. 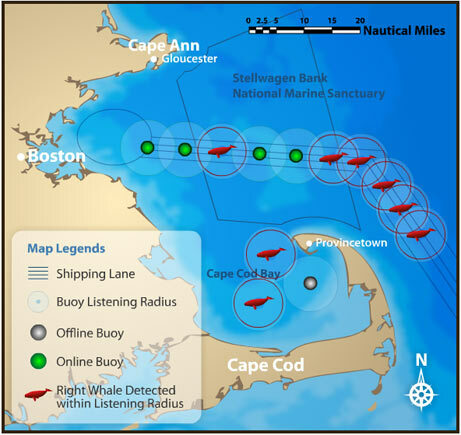 However, sonar also can be a disturbance for acoustically highly sensitive cetaceans, or on the other hand may lead to habituation effects. So called Acoustic Warning Devices (AWDs) likewise increase the general noise in the sea. What is more, all these means have not yet proven their efficacy, and their effects on the animals are not well understood. Night vision systems are thinkable, too, but similar to binoculars they are useless during day time and in fog, albeit their range generally being quite limited. Infrared cameras are able to detect a whale’s or dolphin’s body heat, but they have a limited range too, and are ineffective in high wave conditions. Promising trials have been made with highly sensitive infrared cameras able to detect a whale’s blow at considerable distances. This system is being tested on the German research vessel Polarstern at the moment. Other technical means include propeller shrouding but in larger vessels questions about energy efficiency immediately arise, because hydrodynamics are affected. Two elaborate passive acoustic systems which have been implemented in the USA were mentioned already. Their greatest drawback is the high costs involved. Therefore it is not likely that they will be applied on a broader scale.